I went to Turkey a few years ago for a milestone birthday celebration. During our time in Istanbul, we signed up for a food tour through a company called Culinary Backstreets (check them out next time you are abroad… they specialize in the best hidden food treasures around the world). It was the first time I had ever done anything like it, and to this day, one of my favorite travel experiences. Our guide took us through the back alleys of Istanbul and introduced us to a wide variety of street food. If you have ever been to Istanbul, you know that street food and snacks are way of life there. As a tourist, I was timid and didn’t venture far from chicken kabobs and hummus the first few days. This food tour opened up a whole new world of tasty delights in Turkey and made the rest of the trip rich with delicious meals. One of the stops was in a little kitchen not much bigger than 200 sq feet, tucked away in the twisty corridors of Istanbul’s back alleys. 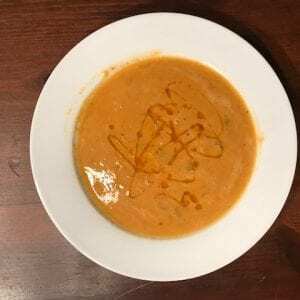 We were served a bowl of red lentil soup. It was light and airy and full of flavor. It was all I could do to not lick the bowl and ask for seconds. Ever since that day, I have looked for a recipe that would replicate it. I am still looking, but this recipe comes close. 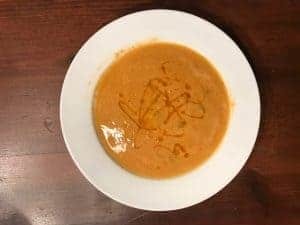 Perfect for these cool fall nights, this soup will warm you up, especially if you use the Harissa Olive Oil. If you don’t like it spicy, use the Meyer Lemon olive oil or a robust EVOO. Heat oil in large pot for a few minutes then saute diced onion and garlic until golden, about 4-5 minutes. Add in spices and tomato paste and saute for another 2 minutes. Add broth, water, lentils, carrot and celery. Bring to a simmer then cover pot and turn to medium low heat. Simmer until lentils are soft, about 30 minutes. Taste and add salt if necessary. Remove about a cup of the soup and put into a separate bowl. Using an immersion blender (or other food processor), blend the rest of the soup until smooth. Add back in the cup that was removed. Soup should be somewhat chunky. Stir in lemon juice and serve. Drizzle a bit of Harissa Olive Oil (for heat) or Meyer Lemon Olive Oil over the top.